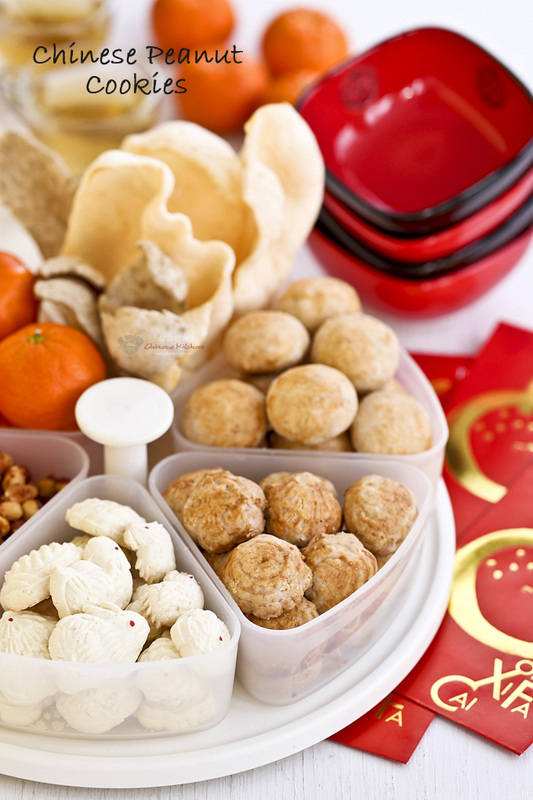 One of the traditions surrounding the Chinese New Year is the practice of matching ingredients that are homonyms of auspicious words. Peanuts fall into this happy category with the Cantonese fah sung rhyming with long life and growing prosperity. Hence, they often appear in all kinds of dishes prepared for the celebrations. I also happen to like peanuts so I have absolutely no objections to this tradition. 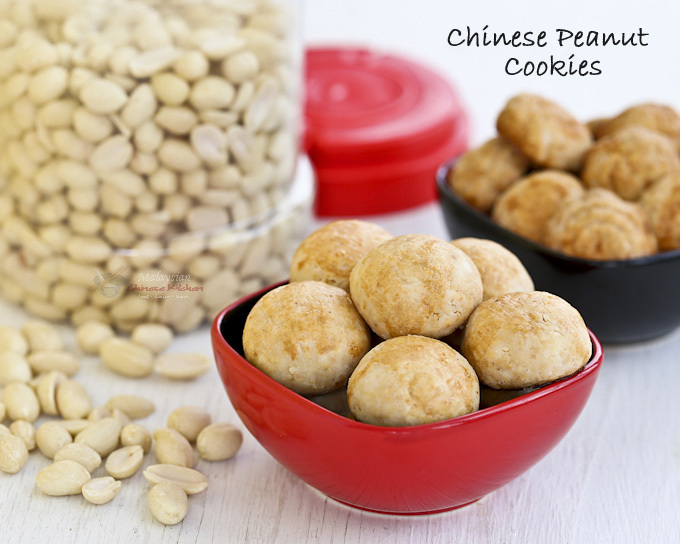 In fact, these Chinese Peanut Cookies are something I look forward to eating every Chinese New Year. Traditionally, ground peanuts are combined with all-purpose flour, sugar, and pork lard to make these delectable cookies. Today, most people would substitute the pork lard with vegetable oil for a less “fatty” version. I have also replaced the sugar with powdered (icing) sugar and the all-purpose flour with rice flour to make them gluten free. White rice flour is finer than all-purpose flour giving these cookies a very smooth with a melt-in-the-mouth texture. For a festive touch, I borrowed my mother-in-law’s excellent idea of molding half of the cookies using wooden Kuih Bangkit molds. The wooden molds with larger indentations are preferred. However, they are still smaller than the hand formed balls. Baking time for these molded cookies should be adjusted accordingly. Place peanuts in a single layer on a shallow baking pan. Roast at 350°F (180°C) for about 12 to 15 minutes until just lightly brown. Remove and allow peanuts to cool. Grind peanuts in a food processor to as fine as possible. Pour into a large bowl. Mix in rice flour, powdered sugar, and salt. Pour in oil and mix well. Peanut and flour mixture should come together. Shape dough into 1-inch balls. Flatten slightly before placing onto parchment lined baking pan. Brush top of cookie with egg wash.
Bake in 375°F (190°C) oven for approximately 18 minutes. Transfer onto wire rack to cool completely. Store in an air tight jar. 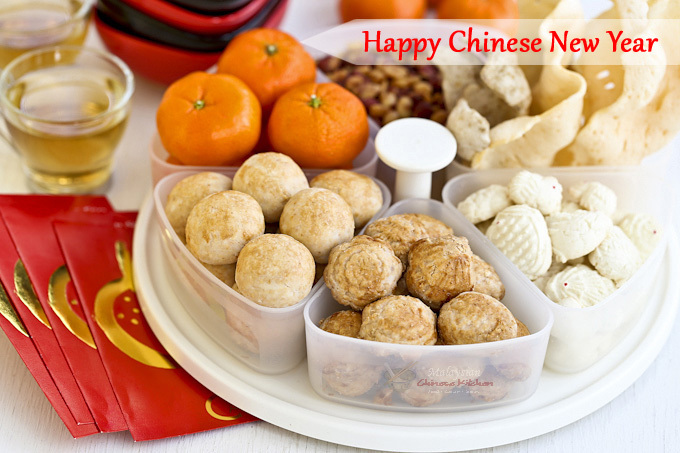 What is the Chinese name for rice flour, is it glutinous flour? Rice flour is just rice flour. Glutinous rice flour is different from rice flour. It is made of glutinous rice, a.k.a sweet rice or sticky rice. Do not use glutinous rice flour for this recipe. I tried this recipe last week and have some peanuts roasting in the oven as I type, so I can make another batch this afternoon 🙂 I just wanted to say thank you for a deliciously simple recipe! I didn’t have rice flour the last time so used potato flour instead. Come out a treat! Hi Linda, thanks for sharing the recipe. Can I replace the vegetable oil with butter or coconut oil? How long can the cookies last in room temp? What are the differences of using cake flour, all purpose flour (plain flour) and rice flour in making the peanut cookies? I think using rice flour makes the cookies lighter. I have never tried cake flour. Can we use plain flour instead of rice flour ? Yes, you can use all-purpose flour but the texture will be different. The cookies will be more dense. Hello, can I use wheat flour instead of rice flour? Please use all-purpose flour instead of whole wheat flour. Hi, when i use rice flour, the dough doesn’t come together and it’s so hard to shape. Is there any tricks to make them come together as it’s always grainy even after 15 mins of kneading. I used olive oil as well, not sure if that makes an difference? I don’t know where you went wrong. Maybe you have to grind the peanuts a little more. Thanks for this recipe. It looks very straight-forward on your excellent video. Our daughter was born in China, so we always celebrate Chinese New Year with a dessert party with lots of friends. It has become MORE important as she has gotten older and we have always tried to accurately include as many cultural traditions, as properly as we can, to ensure that she appreciates her Asian identity as much as we do. Recipes like yours will certainly help me in the kitchen. I was wondering how far in advance I can make the cookies, stored in an air-tight container, wihout risking any change in flavour or freshness? Also, I want to double the recipe. Would you recommend that I make two separate batches or do you think the dough will still come together for molding if I just double all the ingredients at one time? I know that doing so can sometimes compromise the recipe. I am delighted to hear that your family celebrates Chinese New Year with your daughter. Likewise, even though we are far away from our original homeland, I try to celebrate CNY and many of the Chinese festivals so that my two sons will not lose touch with our rich traditions. As they grow older, they do appreciate it even more. As for the peanut cookies, you can make them two to three weeks in advance. You should have no problems doubling the recipe as I have done that before and it worked out just fine. Gong Xi Fa Cai and Xin Nian Kuai Le! Thanks for your lovely reply. It is very convenient for me (and I get top quality products) from nuts.com. I’ve placed several orders with them. I was just about to place my order for rice flour and my fresh peanuts to roast and pulverize when I noticed that they offer roasted and pulverized peanut flour. Essentially what I have been making. I would like to give their “peanut flour” a chance (especially as nuts are their speciality) but I realized that I don’t know a “cup” amount that home roasting and crushing the peanuts equals. (I hope that this question makes sense. If you think I should just stick with the recipe as is please don’t hesitate to say so). I’m not looking for a shortcut, only the best version of the cookie I can make which is the reason I’m shifting to your excellent rice flour replacement. Again, I look forward to your guidance at your convenience. Gong Xi Fa Cai and Xin Nian Kuai Le to you and your lucky family! ? For this recipe, I think it is best to roast and crush the peanuts because peanut flour may be too fine. The texture will certainly be different. I have used peanut flour once to make these Peanut Butter Stamped Cookies (from my other blog) and they were a bit too much. The peanut flour was quite fine and it felt over powering in my mouth. It is hard to explain but I did not like the texture. Perhaps I should have used half peanut flour and half all-purpose flour to make those stamped cookies instead of using only peanut flour. I will try it again sometime if I get some peanut flour. Wishing you and your family a most Happy, Healthy, and Prosperous New Year! why do you use White egg wash as most recipe using egg yolk wash? there any different? It is a matter of preference. White egg wash promotes even browning but little shine while egg yolk wash gives the cookies a shiny look. 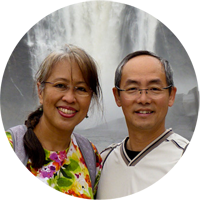 Hi Linda, love your recipe and the cookies literally melt in my mouth! However all of them cracked and I have checked my oven temperature it is only at 170c. Is my oven too hot that had caused all my cookies to crack? Glad you enjoy the recipe. 🙂 As for the cracking, perhaps your cookies may be a little too dry. Hi. Does roasting the peanuts under the stove and in the oven makes a difference in the fragrance of the cookies? I don’t think so and even if it does, the difference will not be noticeable. Thank you for the recipe! It’s so simple and came out just like how i remember it when i get to eat them during the festive days of Chinese New Year. I will definitely make these again and this is coming from someone who is not so good at baking! I have not tried it. You will have to do your own experiment to find out. Can I use the bulk peanut ( unsalted) sold in the store instead of roasting the raw peanuts!